2 Department of Microbiology, College of Basic Sciences, Shahr-e-Qods Branch, Islamic Azad University, Tehran, Iran. Francisella tularensis (F. tularensis) is the etiological microorganism for tularemia. There are different forms of tularemia such as respiratory tularemia. Respiratory tularemia is the most severe form of tularemia with a high rate of mortality; if not treated. Therefore, traditional microbiological tools and Polymerase Chain Reaction (PCR) are not useful for a rapid, reliable, accurate, sensitive and specific diagnosis. But, DNA microarray technology does. DNA microarray technology needs to appropriate microarray probe designing. The main goal of this original article was to design suitable long oligo microarray probes for detection and identification of F. tularensis. For performing this research, the complete genomes of F. tularensis subsp. tularensis FSC198, F. tularensis subsp. holarctica LVS, F. tularensis subsp. mediasiatica, F. tularensis subsp. novicida (F. novicida U112), and F. philomiragia subsp. philomiragia ATCC 25017 were studied via NCBI BLAST tool, GView and PanSeq Servers and finally the microarray probes were produced and processed via AlleleID 7.7 software and Oligoanalyzer tool, respectively. In this in silico investigation, a number of long oligo microarray probes were designed for detecting and identifying F. tularensis. Among these probes, 15 probes were recognized as the best candidates for microarray chip designing. Calibrated microarray probes reduce the biasis of DNA microarray technology as an advanced, rapid, accurate and cost-effective molecular diagnostic tool with high specificity and sensitivity. Professional microarray probe designing provides us with much more facility and flexibility regarding preparation of a microarray diagnostic chip. Keywords: Bioinformatics, DNA microarray, Dry lab, Francisella tularensis, Probe designing, Tularemia. Francisella as the single member of Francisellaceae family has no intimate phylogenetic relatives to other pathogenic bacteria. There are just some far phylogenetic relationships between Francisella, Legionella, and Coxiella burnetti [1, 2]. There are four well-known subspecies belonging to Francisella tularensis (F. tularensis) including holarctica (Type B), mediasiatica, novicida, and tularensis (Type A). F. tularensis subsp. tularensis is recognized as the most deathful subspecies which encompasses a vast range of virulent factors [3-5]. The intracellular gram negative bacterium of F. tularensis is an invasive pathogenic microorganism which may lead to fatal infectious disease of tularemia in the host with a low infective cell number of 10. The zoonotic infection of tularemia is clinically divided into six forms of Glandular, Oculoglandular, Oropharyngeal, Respiratry, Typhoidal and Ulceroglandular diseases [5-10]. Respiratory tularemia is recognized as the most severe form of tularemia with a mortality rate up to 30% if not treated; therefore, F. tularensis is known as a potential biological weapon and categorized in group A of bacterial pathogenic agents [1, 7, 11-15]. Because of the life threatening and severity of respiratory tularemia, the use of a rapid, accurate, and reliable diagnostic technique is an urgent. An accurate diagnosis may lead to a definite and effective treatment. Hence, among different diagnostic methods such as microbiological cultures, serological assays, Polymerase Chain Reactions (PCRs) including real-time PCR, Enterobacterial Repetitive Intergenic Consensus PCR (ERIC-PCR) etc. and other routine techniques, the advanced molecular technique of DNA microarray is recommended [16-22]. DNA microarray technology is an advanced pan-genomic diagnostic technique which is consisted of two main parts including Dry Lab and Wet Lab. The bioinformatic section which covers the dry lab procedures is known as the in silico portion of the DNA Microarray technique. So, the probe designing processes construct the dry lab section of the tool. The wet lab of the technique concludes the in vitro portion of the technique. The wet lab section is composed of probe printing on a suitable coated surface of a glass slide (by robotic spotter), labeling of target bacterial genome (by fluorescent dyes such as Cy3 and Cy5), hybridization process (manually or automatically) and scanning. Even an ideal performed wet lab section is completely depended on the accuracy of probe designing procedures. An appropriate microarray probe designing guarantees the accuracy of outcomes resulted from DNA microarray technology and reduces the probable biases. Of course, a non-expertized done probe designing predominates the expertized wet lab procedures and gives huge noises, biases and enormous errors in final data. A well done microarray probe designing guarantees a rapid, accurate, sensitive, specific and cost effective diagnostic technique when the number of clinical specimens is high [16, 19, 20, 23-28]. Therefore, the main goal of the present research is to provide and design best candidates of microarray probes for diagnosing F. tularensis. As mentioned before, F. tularensis involves four subspecies of holarctica (Type B), mediasiatica, novicida, and tularensis (Type A). Besides, F. philomiragia is another species within the genus. However, there are considerable similarities between species and subspecies [1, 2, 29-31]. For this reason, the authors have used GView Server (https://server.gview.ca) to show unique sequences in F. tularensis subspecies and F.philomiragia (Fig. 1) [24, 25, 32, 33]. Regarding to GView Server application, the “unique genome” was selected for analysis type. Then the .gbk file belonging to F. tularensis subsp. tularensis FSC198 chromosome complete genome was downloaded from NCBI FTP site in FASTA format (http://ftp.ncbi.nlm.nih.gov/genomes/Bacteria/), zipped and uploaded as a reference genome [24, 25, 32-34]. Then, the downloaded .fna files belonging to F. tularensis subsp. holarctica LVS (Type B), F. tularensis subsp. mediasiatica, F. tularensis subsp. novicida (F. novicida U112), and F. philomiragia subsp. philomiragia ATCC 25017 from (https://lfz.corefacility.ca/panseq/analyses/) were also zipped and uploaded for comparing their genomes with the genome of F. tularensis subsp. tularensis FSC198 (Fig. 1). All of the parameters in GView Server were set up as default position of the server [24, 25, 32, 34, 35]. For determining and analysing the unique sequences of F. tularensis subsp. tularensis FSC198 (NC_008245), the PanSeq Server (http://blast.ncbi.nlm.nih.gov/Blast.cgi?PROGRAM=blastn&PAGE_TYPE=BlastSearch&LINK_LOC =blasthome) was used. To perform the analysis throughout the novel region detector, F. tularensis subsp. tularensis FSC198 (NC_008245) presumed as the selected query and the other aforementioned species and subspecies were determined as selected references. Because of high genomic similarities among F. tularensis subspecies, the F. tularensis subsp. tularensis FSC198 complete genome was compared only with F. philomiragia subsp. philomiragia ATCC 25017 chromosome complete genome. The related parameters in PanSeq Server were set up according to default choices [1, 2, 24, 25, 29-31, 33]. The unique sequences of F. tularensis subsp. tularensis FSC198 were finally detected and blasted by the BLAST tool which is accessible via NCBI (http://blast.ncbi.nlm.nih.gov/Blast.cgi? PROGRAM=blastn & PAGE_TYPE= BlastSearch& LINK_LOC=blasthome) [16, 19, 24, 25, 33, 34, 36, 37]. The super unique regions identified by BLAST tool were then processed for microarray probe designing. Therefore, the AlleleID 7.7 software was used for designing long oligo microarray probes. The length of probes were selected between 55 and 64 nucleotides. Other parameters regarding AlleleID software were selected in accordance with default forms [16, 24, 25, 33, 34]. The designed probes were then evaluated via NCBI BLAST tool. The confirmed microarray probes were finally tested by oligoanalyzer 3.1 (https://eu.idtdna.com/calc/analyzer) (an online tool) for appropriate structure and suitable physico-chemical characteristics. The related properties were identified via hairpin button. Other parameters were presumed as default position. Finally, the proper microarray probes were designed and produced to prepare a diagnostic DNA microarray chip [16, 19, 24, 33, 34, 36]. The genomic maps relating to each species and subspecies are shown in Fig. (1). The figure indicates the comparative pangenomic result obtained from pangenome analysis achieved by GView Server. Each color is pertaining to an individual strain. The colored regions involved similar sequences relating to genomes while the white regions are unique sectors among bacterial cases. Fig. (1). A comparison between F. tularensis subsp. tularensis FSC198 (NC_008245), F. tularensis subsp. holarctica (NC_007880), F. tularensis subsp. mediasiatica (NC_010677), F. tularensis subsp. novicida (F. novicida U112) (NC_008601), and F. philomiragia (NC_010336) for showing unique sequences within their genomes. In addition to Gview server, the pan-genomic analyses achieved by PanSeq server. The results revealed unique genomic sectors within the aforementioned species and subspecies genomes including F. tularensis subsp. tularensis FSC198 (NC_008245), F. tularensis subsp. holarctica (NC_007880), F. tularensis subsp. mediasiatica (NC_010677), F. tularensis subsp. novicida (F. novicida U112) (NC_008601), and F. philomiragia (NC_010336). These analyses were vital for recognizing the unique regions for each strain. The utilization of important pangenomic servers like Geview and PanSeq, BLAST tool (NCBI), probe designing soft ware of AlleleID 7.7 was necessary for obtaining 15 probes as the best candidate long oligo DNA microarray probes for detection and identification of F. tularensis. The processed and best candidate long oligo DNA microarray probes with high sensitivity and specificity are indicated in Table 1. These suggested probes were appropriate for recognition of F. tularensis . Table 1. 15 Best candidate microarray probes for detection and identification of F. tularensis. Tularemia is recognized as a reemerging infectious disease with a high number of outbreaks in different countries. Besides, there are many similarities between respiratory tularemia and other respiratory infectious diseases such as mycobacterial tuberculosis, mycotic and different bacterial pneumonia, lung abscess, lung lymphoma, lung carcinoma, influenza and acute respiratory distress syndrome (ARDS). The general clinical demonstrations relating to pulmonary tularemia are variable from bronchitis, bronchopneumonia and pharyngitis to hilar lymphadenitis and pleuropneumonitis [6, 13, 15, 38, 39]. Because of the severity of respiratory tularemia and its fast progression within the host tissues, a rapid, accurate, sensitive, specific, reliable and cost effective diagnostic technique like microarray technology is needed for an appropriate diagnosis and a definite antibiotic therapy [8, 16-20, 23, 40-44]. There are different traditional microbiological diagnostic methods including direct microscopic observations of clinical specimens, histological studies, medium culture, serological assays, enzyme linked immuno sorbent assay (ELISA), and imaging. But these techniques are time consuming with low specificity and sensitivity [6, 7, 45]. PCRs such as nested PCR, ERIC PCR, real-time PCR are suitable diagnostic assays with high accuracy, sensitivity and specificity when the number of samples is low. They also are cost effective; but, they are not accurate, sensitive, specific and cost effective in the cases with huge number of specimens [16, 17, 21, 24, 25, 36, 41, 43, 46]. Indeed, the microarray technology is used for detection and identification of several microbial DNA sequence targets which are mixed within a clinical specimen [22, 47]. The microbial genomics has increased the optimization of diagnostic methods during last decade. The progression of free web databases and next generation sequencing (NGS) technologies such as DNA microarray provide us with a rapid, and reliable diagnostic tool for accurate detection and identification of pathogenic agents in microbiological samples to have definite therapeutic methods [16, 19, 20, 41]. Despite the importance of each procedure of DNA microarray technique, the probe designing performance is a critical and considerable procedure which makes DNA microarray technology a rapid, reiable, accurate, sensitive, specific and flexible diagnostic method. The sequence, calibration and the length of microarray probes directly affect the quality of analytical outcomes [16, 23-25, 33, 42, 48]. DNA microarray technology is an advanced diagnostic tool which enables us to detect and identify the target DNA sequences among hundreds of thousand sequences, genes, and microorganisms. As, the human respiratory tract possesses a complicated microbiome and the pathogenic agents of this tract include bacteria, fungi, parasites and viruses, so DNA microarray technology is a proper and preferred diagnostic tool [16, 20, 43, 49, 50]. According to the text above, rapidity and accuracy are two important factors in association with recognition of respiratory tularemia; Because, a rapid and accurate diagnosis may lead to a fast and definite treatment which resulting in improvement and reducing the mortality rate among patients with pulmonary tularemia. Moreover, the possibility of microarray probe designing provides us to have a vast range of probes. This ability makes DNA microarray a flexible, easy, simple, cost effective and useful technique. Moreover, the DNA microarray technique is able to recognize multi-drug resistant microbial strains [24, 26, 33]. Microarray probe designing enables us to choose the best candidates among several choices and to design a microarray chip with local genomic microbial species and strains with high efficacy. An expert of microarray probe designing, reduces the cost of chip upgrading process. This research was supported by a grant provided by Deputy of Research and Technology, Ministry of Health and Medical education, Tehran, Iran. Larsson P, Oyston PC, Chain P, et al. The complete genome sequence of Francisella tularensis, the causative agent of tularemia. Nat Genet 2005; 37(2): 153-9. Forsman M, Sandström G, Sjöstedt A. Analysis of 16S ribosomal DNA sequences of Francisella strains and utilization for determination of the phylogeny of the genus and for identification of strains by PCR. Int J Syst Bacteriol 1994; 44(1): 38-46. Ariza-Miguel J, Johansson A, Fernández-Natal MI, et al. Molecular investigation of tularemia outbreaks, Spain, 19972008. Emerg Infect Dis 2014; 20(5): 754-61. Rossow H, Forbes KM, Tarkka E, et al. Experimental infection of voles with francisella tularensis indicates their amplification role in tularemia outbreaks. PLoS One 2014; 9(10): e108864. Behzadi P, Ranjbar R. Enzymatic pathways of intracellular survival, replication and phagosomal escape of francisella spp. : A review. MEDT 2015; 1: 1-5. Petersen JM, Schriefer ME. Tularemia: emergence/re-emergence. Vet Res 2005; 36(3): 455-67. Tärnvik A, Chu MC. New approaches to diagnosis and therapy of tularemia. Ann N Y Acad Sci 2007; 1105: 378-404. Çelebi G, Baruönü F, Ayoğlu F, et al. Tularemia, a reemerging disease in northwest Turkey: epidemiological investigation and evaluation of treatment responses. Jpn J Infect Dis 2006; 59(4): 229-34. Akalin H, Helvaci S, Gedikoğlu S. Re-emergence of tularemia in Turkey. Int J Infect Dis 2009; 13(5): 547-51. Feldman KA, Enscore RE, Lathrop SL, et al. An outbreak of primary pneumonic tularemia on Marthas Vineyard. N Engl J Med 2001; 345(22): 1601-6. Syrjälä H, Kujala P, Myllylä V, Salminen A. Airborne transmission of tularemia in farmers. Scand J Infect Dis 1985; 17(4): 371-5. Zargar A, Maurin M, Mostafavi E. Tularemia, a re-emerging infectious disease in Iran and neighboring countrie. Epidemiol Health 2015; 37: e2015011. Sjöstedt A. Tularemia: history, epidemiology, pathogen physiology, and clinical manifestations. Ann N Y Acad Sci 2007; 1105: 1-29. Dennis DT, Inglesby TV, Henderson DA, et al. Tularemia as a biological weapon: medical and public health management. JAMA 2001; 285(21): 2763-73. Najafi A, Ram M, Ranjbar R. Microarray: Principles & applications. 1st ed. Tehran: Persian Science & Research Publisher 2012. Behzadi P, Ranjbar R, Alavian SM. Nucleic Acid-based approaches for detection of viral hepatitis. Jundishapur J Microbiol 2014; 8(1): e17449. Behzadi P, Behzadi E, Ranjbar R. The application of Microarray in Medicine. ORL'ro 2014; 24: 24-6. Behzadi P, Behzadi E, Ranjbar R. Microarray data analysis. Alban Med J 2014; 4: 84-90. Behzadi P, Behzadi E, Ranjbar R. Microarray and respiratory tract infections. ORL'ro 2015; 29: 34-6. Ranjbar R, Tabatabaee A, Behzadi P. Enterobacterial repetitive intergenic consensus polymerase chain reaction (ERIC-PCR) genotyping of escherichia coli strains isolated from different animal stool specimens. Iran J Pathol [In press]. Miller MB, Tang YW. Basic concepts of microarrays and potential applications in clinical microbiology. Clin Microbiol Rev 2009; 22(4): 611-33. Behzadi P, Behzadi E, Ranjbar R. Microarray probe set: Biology, bioinformatics and biophysics. Alban Med J 2015; 2: 78-83. Behzadi P, Najafi A, Behzadi E, Ranjbar R. Microarray long oligo probe designing for Escherichia coli: an in-silico DNA marker extraction. Cent European J Urol 2016; 69(1): 105-11. Behzadi P, Ranjbar R. Microarray long oligo probe designing for Bacteria: An in silico pan-genomic research. Alban Med J 2016; 2: 5-11. Behzadi P, Behzadi E, Ranjbar R. IL-12 family cytokines: General characteristics, pathogenic microorganisms, receptors, and signalling pathways. Acta Microbiol Immunol Hung 2016; 63(1): 1-25. Jonczyk R, Kurth T, Lavrentieva A, Walter JG, Scheper T, Stahl F. Living cell microarrays: an overview of concepts. Microarrays (Basel) 2016; 5(2): E11. Patel A, Cheung SW. Application of DNA microarray to clinical diagnostics. Methods Mol Biol 2016; 1368: 111-32. Kingry LC, Petersen JM. Comparative review of Francisella tularensis and Francisella novicida. Front Cell Infect Microbiol 2014; 4: 35. Grunow R, Splettstoesser W, McDonald S, et al. Detection of Francisella tularensis in biological specimens using a capture enzyme-linked immunosorbent assay, an immunochromatographic handheld assay, and a PCR. Clin Diagn Lab Immunol 2000; 7(1): 86-90. Broekhuijsen M, Larsson P, Johansson A, et al. Genome-wide DNA microarray analysis of Francisella tularensis strains demonstrates extensive genetic conservation within the species but identifies regions that are unique to the highly virulent F. tularensis subsp. tularensis. J Clin Microbiol 2003; 41(7): 2924-31. Sankarasubramanian J, Vishnu US, Sridhar J, et al. 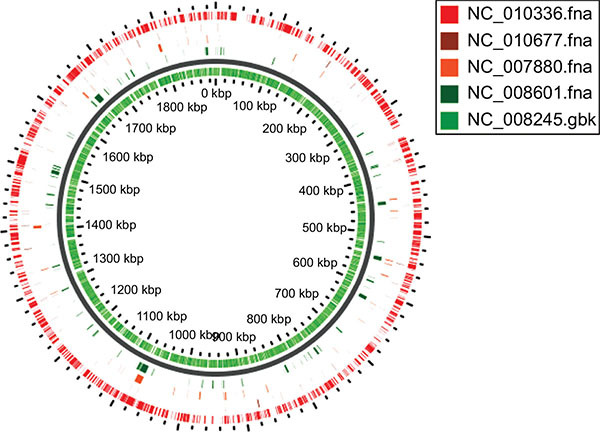 Pan-Genome of Brucella Species. Indian J Microbiol 2015; 55: 88-101. Jahandeh N, Ranjbar R, Behzadi P, Behzadi E. Uropathogenic Escherichia coli virulence genes: invaluable approaches for designing DNA microarray probes. Cent European J Urol 2015; 68(4): 452-8. Khazaei Z, Najafi A, Piranfar V, Mirnejad R. Microarray-based long oligonucleotides probe designed for Brucella Spp. detection and identification of antibiotic susceptibility pattern. Electron Physician 2016; 8(4): 2297-303. Barel M, Charbit A. Francisella tularensis intracellular survival: To eat or to die. Microbes Infect 2013; 15: 989-97. Behzadi P, Behzadi E, Ranjbar R. Basic Modern Molecular Biology. 1st ed. Tehran: Persian Science & Research Publisher 2014. Cho H, Chou HH. Thermodynamically optimal whole-genome tiling microarray design and validation. BMC Res Notes 2016; 9: 305. Maurin M, Pelloux I, Brion JP, Del Banõ JN, Picard A. Human tularemia in France, 20062010. Clin Infect Dis 2011; 53(10): e133-41. Miller RP, Bates JH. Pleuropulmonary tularemia. A review of 29 patients. Am Rev Respir Dis 1969; 99(1): 31-41. Johansson A, Lärkeryd A, Widerström M, et al. An outbreak of respiratory tularemia caused by diverse clones of Francisella tularensis. Clin Infect Dis 2014; 59(11): 1546-53. Fournier PE, Dubourg G, Raoult D. Clinical detection and characterization of bacterial pathogens in the genomics era. Genome Med 2014; 6(11): 114. Behzadi P, Najafi A, Behzadi E, et al. Detection and identification of clinical pathogenic fungi by DNA microarray. Infectio'ro 2013; 35: 6-10. Behzadi P, Behzadi E. Environmental Microbiology. 1st ed. Tehran: Niktab Publisher 2007. Franz DR, Jahrling PB, Friedlander AM, et al. Clinical recognition and management of patients exposed to biological warfare agents. JAMA 1997; 278(5): 399-411. Syrjälä H, Koskela P, Ripatti T, Salminen A, Herva E. Agglutination and ELISA methods in the diagnosis of tularemia in different clinical forms and severities of the disease. J Infect Dis 1986; 153(1): 142-5. Janda JM, Abbott SL. 16S rRNA gene sequencing for bacterial identification in the diagnostic laboratory: pluses, perils, and pitfalls. J Clin Microbiol 2007; 45(9): 2761-4. Ventimiglia G, Alessi E, Petralia S. A bridge-like solution for Universal Microarray applications. Sens Actuators B Chem 2016; 232: 102-6. Nsofor CA. DNA microarrays and their applications in medical microbiology. Biotechnol Mol Biol Rev 2014; 9: 1-11. Wozniak-Kosek A, Kosek J, Zielnik-Jurkiewicz B. Detection of respiratory tract pathogens with molecular biology methods. Adv Exp Med Biol 2015; 835: 9-13. Fournier PE, Drancourt M, Raoult D. Bacterial genome sequencing and its use in infectious diseases. Lancet Infect Dis 2007; 7(11): 711-23.